Remember The Video Game Debate? The game research book edited by Thorsten Quandt and Rachel Kowert, the latter of whom we’ve been covering here since Massively-that-was? Good. 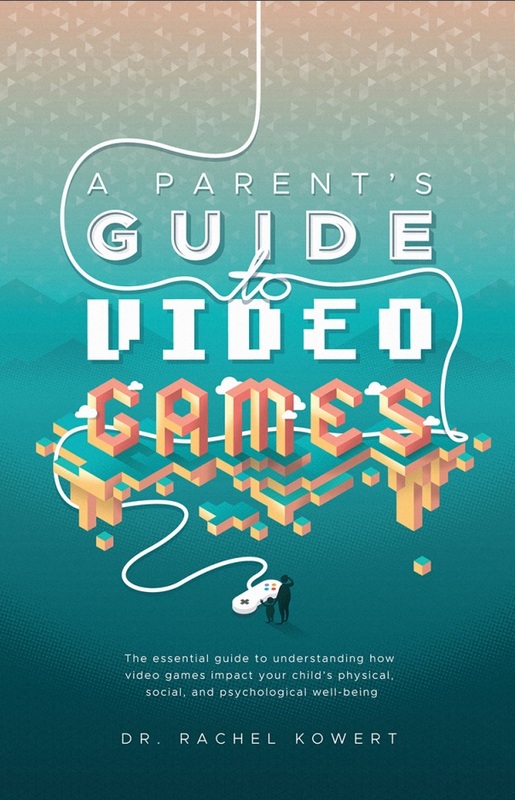 Dr. Kowert’s got a new book out called A Parent’s Guide to Video Games. I was sent an early draft of the new title for review purposes, along with some of the additions going in prior to printing. I originally thought it would be just an updated reworking of The Video Game Debate, but I was very wrong. Dr. Kowert’s new book is much shorter and easier to access for the non-academic than the last one, which might make it even more useful for gamers who aren’t in research fields. As some readers may know, I spent the past several years in Japan, and while I was there, the only books I read were textbooks, research journals, and manga (language textbooks don’t teach often teach you the slang you need to know to understand high school kids!). For me, The Video Game Debate was typical reading. And when the book came out, I recommended it friends and colleagues, but the journal format was a turn-off for way too many of them. That’s what sparked the idea for me to dissect the findings over my series of articles here on MOP and apply them to topics MMO gamers (hopefully!) care about. 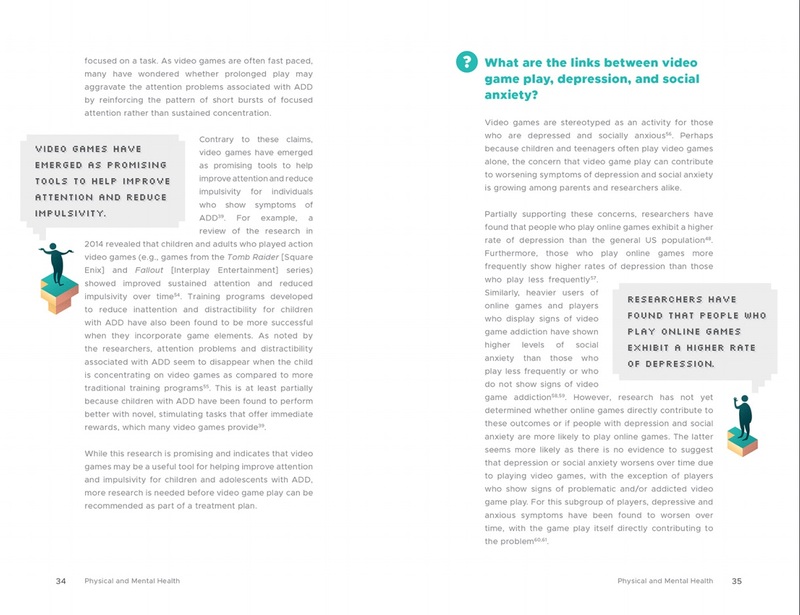 The same won’t need to be done for Dr. Kowert’s A Parent’s Guide to Video Games. Look at the above image: simple paragraphs uncluttered from citation, a few images, text bubbles breaking up ideas, and remarkably, well, accessible. That’s important because like The Video Game Debate, this is a book that seeks to break down the journal paywall keeping good research out of the public’s reach. The dialogue bubbles aren’t just there to be cute. They’re common concerns, thoughts, or advice at the heart of most paragraphs. They make finding specific issues easy for those just browsing out of curiosity, but there’s still citation numbers in text on facts and figures that allow the more academically minded to check sources. Heck, just reading the bubbles can be used as a sort of short cut to understanding a lot of the book, which is just what busy parents need. I’ve made several comparisons to the last book Dr. Kowert edited, but A Parent’s Guide to Video Games doesn’t just reuse The Video Game Debates’ sources; it adds to them with recent research, and not all from the previous books’ authors. Just as before, Dr. Kowert’s presentation is balanced, offering research that both praises and damns games. For example, Mathew Grizzard’s 2016 study on repeated play of video games suggests that repetition reduced the games’ ability to elicit guilt, taking away some of the power we’ve discussed about games having in terms of morality. It’s it’s a good example of how the book does use references that challenge the positive side of video games, and you need that in proper research. Otherwise, your bias shows more strongly, making it difficult for critical readers to take research seriously. More importantly for those who read Video Game Debate, she’s got updated sources, since even now it’s still incredibly difficult to prove scientifically playing video games leads to anti-social attitudes or bullying among children and adolescents, but online harassment continues and may be linked with games’ reputation as a “boys” activity. While having some extra sources may seem like a minor thing for lay people, for anyone outside of academic research (and some in! ), collating good research on video games is a big deal since there’s so little of it to begin with. Addiction is another key topic. This is something older people still approach me about with concern, not just that I personally might be addicted to games but that I might get someone else hooked on a game using my particular pool of knowledge. The findings between the two books aren’t so different, but the facts are laid out in a way that I think are more accessible to non-specialists this time. At the very least, since the book is rather short, it could prove a valuable tool during the holidays at family gatherings filled with game-fearing ignoramuses. Other sections Dr. Kowert herself covered in great detail with all their gory complications in The Video Game Debate are drastically simplified here in ways I think most readers can understand (but again, those looking to dig deeper have the opportunity to investigate her sources and judge them for themselves). The “further reading” section has suggestions for the biggest topics covered by the book, including both academic and entertainment based sources, in addition to the citations of studies and articles. I even noticed one source isn’t yet in print, so the book should stay relevant for a while, barring any major breakthroughs in video game research. If you got through The Video Game Debate unscathed, A Parent’s Guide to Video Games will be light reading most useful for finding new research and sources, or perhaps a resource to loan out to those who may not be able to grapple with heavy reading. However, if our previous coverage of the book got you curious about academic game research but you had trouble spelunking into it yourself, Dr. Kowert’s new book is so much more accessible. It’s release around the holidays seems well-timed. If you know someone trying to grapple with gaming and raising kids, this might help ease the situation for them.